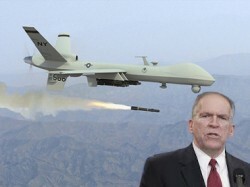 Soon-to-be CIA director, John Brennan, and one of the CIA drones he wants to introduce you to. How many Americans are aware that their government has claimed the authority to arbitrarily kill their fellow citizens when it chooses, and that it can do so ‘legally’, without any evidence that the citizen in question posed any threat to anyone, let alone the US government or its ‘interests’? How many Americans are aware that the US government has responded to court cases brought by the ACLU questioning the US government’s authority to engage in targeted assassinations of US citizens by saying that this is a political question and that US courts and judges have no say in the matter (“There exists no appropriate judicial forum to evaluate these constitutional considerations“)? I’d wager not many. But that’s precisely what the US government has done, according to a leaked unsigned and undated Justice Department white paper, obtained by NBC News. You can read the white paper here. The actual legal justification as defined by Justice Department lawyers in 2010 is being kept secret by the government, but the ‘white paper’ explains that, not only has the government decided that targeted assassinations without due process are legal, but that no evidence of any imminent threat from a target is necessary for the target to be deemed an imminent threat. (Go figure). Did ya get that? An ‘operation leader’ (i.e., any American citizen that the government decides poses a threat to US persons or interests) does not have to be planning to do anything at all to end up on the ‘kill list’, also euphemistically (and nonsensically) known as the ‘disposition matrix‘. To be fair, the white paper does acknowledge that in pursuing this policy of targeting America citizens for assassination there exists “the risk of erroneous deprivation of a citizen’s life“, but look on the bright side, if you happen to be erroneously deprived of your life by a CIA drone, your family can always sue. The full extent of the latest round of insanity that has gripped the American government came to light last week when Obama’s nominee for CIA Director, John Brennan, was ‘questioned’ in front of a Senate confirmation hearing panel, chaired by the ever crone-like Dianne Feinstein. Obama had already nominated Brennan for CIA Director in 2008-9 but he was rejected on the basis that his previous enthusiastic support for torture and extraordinary rendition under Bush (where he served as director of the ‘Terrorist Threat Integration Center’ from 2003 to 2004, an office that sifted through and compiled information for Bush’s daily ‘secret intelligence’ briefings) made him unsuitable for the job. That decision was highly unusual given that being a torture-loving homicidal freak who gets his jollies from ordering the abuse and dismemberment of innocent people is more or less the CIA Director’s job description. So perhaps the real reason Brennan’s nomination was rejected in 2008 was because he wasn’t sufficiently torture, maim and kill-happy to protect the American people by enforcing American corporate hegemony in foreign countries. This time however, things would be different. 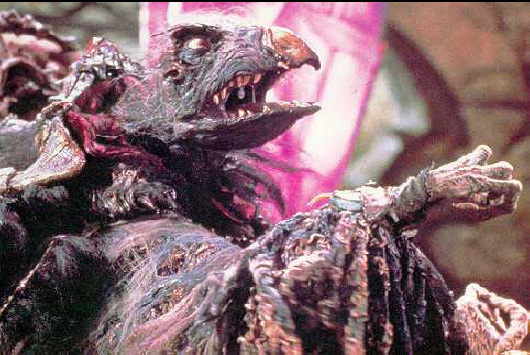 Brennan arrived at the hearing with a plan to prove his credentials for the top position in the CIA by arguing for the right of the US government to kill American citizens without due process. (a Washington insider has informed me that, if that didn’t work, Brennan planned to eat a baby on live television). Surely advocating the government’s legal right to arbitrarily kill American citizens is a step up from the Bush torture program, and would convince the Senate that Brennan really was the man for the job? Much of the discussion at the hearing centered around the CIA’s drone program, drones being the weapon of choice for cowards with a penchant for mass murder, although by no means the only instrument of death wielded by the CIA and US military. Notice Brennan’s response to the question: like the ‘white paper’ on targeted killing, Brennan engages in Orwellian double speak and wants to “optimize transparency AND optimize secrecy”! Transparent secrecy it is then! (oxymorons do not present a problem of logic for a pathological mind). Brennan then cites alleged “legal boundaries” to the US citizen assassination program, and states that the American people should be “quite pleased” that the psychopaths in the CIA would only decide to kill an American as a “last resort”. Legal boundaries here are largely irrelevant because the US government has ALREADY decided that, if a US citizen fits the profile, then it can ‘terminate” him or her as and when it chooses to do so. Then again, I suppose it might provide some comfort to the family of the assassinated US citizen that he was suddenly and unexpectedly murdered by the US government as a ‘last resort’. the Underwear bomber, Abdul mutallab, who was most likely a mind-controlled patsy who was given direct help by a ‘well-dressed man’ to board the plane to Detroit. the ridiculous Times square ‘car bomb’ by Pakistani American Faisal Shahzad. A victim of an FBI ‘sting’ operation whose idea of a ‘car bomb’ was a car with a couple of barrels of gasoline and some fire crackers. the ‘printer cartridge cargo plane bombs‘ of 2010 (right before mid-term election time in the US) that were found on a Fed Ex and a UPS cargo plane, both of which originated in Yemen and were destined for the US. Strangely enough, British police and police sniffer dogs were completely unable to find any trace of explosives in the printers and even insisted that there were none, until MI6 officers flew the printer and the cartridge in a police helicopter to a government laboratory outside London, the Defence Science and Technology Laboratory at Fort Halstead, and subsequently “discovered” the bomb in a final search. What Feinstein was clearly attempting to do here was help Brennan to justify the targeted assassination of American citizens on the basis of the manufactured reality of a ‘terrorist threat’. For several years the CIA has been employing “signature strikes” – which is a euphemism for targeting and killing people without even knowing who they are – as part of its ‘Drone program’. So we’re not just talking about taking out ‘enemy combatants’ here; we’re not just talking about killing ‘known terrorists’, even when there is no information that they are planning any attack against US interests; we’re talking about killing people with missiles in full knowledge that there is NO knowledge of who these ‘targets’ even are. And that same ‘Drone program’ has now been officially extended to cover the inhabitants of the American ‘homeland’. Everyone ok with that? Cool. So there ya have it. Americans can now be assassinated by their government without due process if they step out of line in such a way as to get their names put on the list of ‘domestic terrorists’. And to be honest, they have no one to blame but themselves. Certainly, those who have, to one extent or another, bought into the terror threat lie and the event that spawned it – the 9/11 attacks – can’t complain. They were duped for sure, but they had plenty of opportunities to disbelieve the lies and wake up to the fact that it was really all about the expansion of Empire and the control of resources (including human resources) abroad and at home. 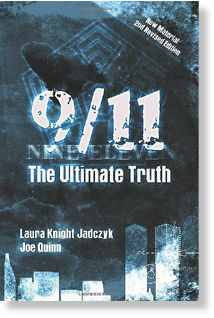 The weird thing is that around 50% of the American public have suspected for a long time that 9/11 was an inside job of some sort, yet the persistent propagandizing of the ‘terror threat’ appears to have got the better of even them. How else can we explain the fact that the US government has been able to gain their consent for the torture of innocent people? How else can we explain the fact that the supposed greatest democracy on Earth has just claimed the right to assassinate American citizens without Due Process? Terrorizing Americans into accepting torture as ‘ok’ was the first step in denaturing their humanity, and it prepared the way for acceptance of the idea that Americans themselves could be deemed ‘enemy combatants’ and murdered by their government, all in the name of protecting them and ‘saving American lives’, as Brennan claims. It has been understood for a long time that torture doesn’t work as a means to obtain accurate information from a person. If a person knows the answers to the questions being put to him, in most cases the threat of torture is enough to make him spill the beans. But the CIA has kidnapped people off the streets of foreign towns and cities with little or no proof that the person in question knows anything of interest. People like that, who don’t know the answers to the questions that are being ‘asked’, will, under torture, simply make something up to stop the abuse. There have been countless reports of this kind of dodgy ‘intelligence’ being extracted and used to justify the continuation of the ‘war on terror’. So the question then is: why would the CIA and US government continue to advocate and practice torture when the odds are that they will get bogus confirmation of their suspicions or bogus evidence of their beliefs? For the answer, you need to understand first that the entire ‘war on terror’ is fake. There is no ‘Islamic terror threat’ against the US and it’s so-called ‘freedom and democracy’. When you understand that, you understand why the fact that torture doesn’t produce accurate information is not only not a problem for the CIA and the warmongers, it’s precisely what they’re looking for. That is to say, the people who have planned and carried on the ‘war on terror’ as a cover for a war of Imperial conquest, are not looking for actual evidence of a terror threat against the US, because they know none exists. What they ARE looking for is fabricated evidence of a terror threat to back up the fabricated ‘war on terror’, and what better way to get such ‘information’ than from some guy you kidnap off the street and torture until he agrees that he is part of a terror plot that you yourself made up? The same rationale is behind the US government’s Guantanamo Bay torture center. Why would the US government be holding men there if they didn’t pose a ‘terrorist’ threat? Well, that’s precisely the point. 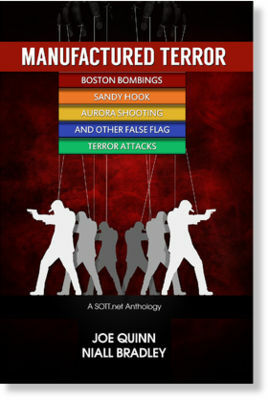 They are holding them to create the impression for the American people that some kind of terror threat exists.Those unfortunate innocents locked up and tortured daily (in different ways) exist only to produce fabricated evidence, on demand, that constitutes the substance of the fabricated narrative of a ‘war on terror’, complete with ‘real terrorists’. The thing is, I fully understand why the CIA and US government is demanding that they need no evidence of terrorism to assassinate whoever they want. If they had to produce evidence of terroristic intentions every time they wanted to murder a bunch of people, how could they possibly kill innocent people and get away with it? The ‘war on terror’ is not, and never has been, about fighting terrorism. It has always been about protecting American interests (aka ‘the American right to dominate and enslave as much of the world as possible’) and to do that, you’re gonna have to kill a bunch of folks terrorists who get in your way. 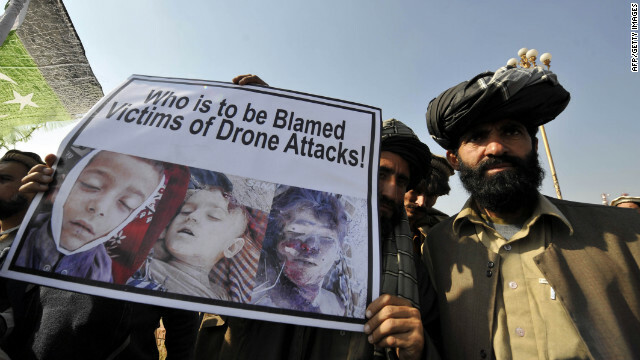 The vast majority of those killed by drone strikes in Afghanistan and Pakistan are civilians, including children. To date, CIA and US military drone strikes have killed about 4,000 people. The Pakistani interior minister Rehman Malik has stated that 336 American drone strikes in Pakistan alone have claimed over 2,300 victims, 80% of whom were innocent civilians. The vast majority of those killed in Pakistan and Yemen and Afghanistan and Somalia and Iraq, have been targeted for resisting the US occupation in its various forms (which includes US support for corrupt and brutal rulers). There’s nothing new in that. The British Empire did exactly the same thing. The only difference is that the modern American Empire has couched all of its Imperial expansion, plunder and murder, in terms of fighting a ‘war on terror’, and they have gone to significant lengths to manufacture the ‘terrorist threat’ as the substance for their cover story. In the unlikely event that the historical record breaks with tradition and records the truth, it will record that, in the great ‘war on terror’ of the 21st century, the terrorists actually won. That they achieved their aim of destroying ‘American freedoms’ by forcing the US government to strip away all of the most basic freedoms enshrined in the US Bill of Rights, and somehow managed to get the US government to view US citizens as potential enemies who needed to be controlled by the threat of ‘imminent’ assassination. As an addendum, it would also note that the ‘terrorists’ were actually inside the US government and its covert agencies like the CIA and that their plan all along was to fool the American and world public into accepting their own enslavement. It might also note that the reason the elite strove to herd the US (and global) population to such a fine order of control was to ensure that, when it became obvious to the people of the world that the real threat to their freedoms, and their very lives, was from cyclical catastrophe in the form of meteorite/cometary fragment bombardment of the Earth, there would be no opportunity for a revolution of the masses, but rather widespread, fear-based apathy and resignation to their status as little more than cattle bound for the slaughterhouse.